We’d love your help. Let us know what’s wrong with this preview of Greek Gods #squadgoals by Courtney Carbone. OMG Classics, the greatest stories ever told . . . in texts. Imagine: What if Mount Olympus got WiFi and the gods and goddesses had smartphones? The classic Greek myths get new life in irreverent and hilarious texts and posts! Zeus, a king of the gods always in search of a new bae. A squad of goddesses who can’t resist stirring the pot. And the selfie-obsessed heroes out OMG Classics, the greatest stories ever told . . . in texts. Imagine: What if Mount Olympus got WiFi and the gods and goddesses had smartphones? The classic Greek myths get new life in irreverent and hilarious texts and posts! And the selfie-obsessed heroes out for all the likes. If you have trouble telling Perseus from Theseus (#Greek2Me) or have ever wondered about Oedipus’s tragic dating profile or why Medusa’s Instagram never got traction—this satirical book of Greek myths retold for the Internet age is for you! 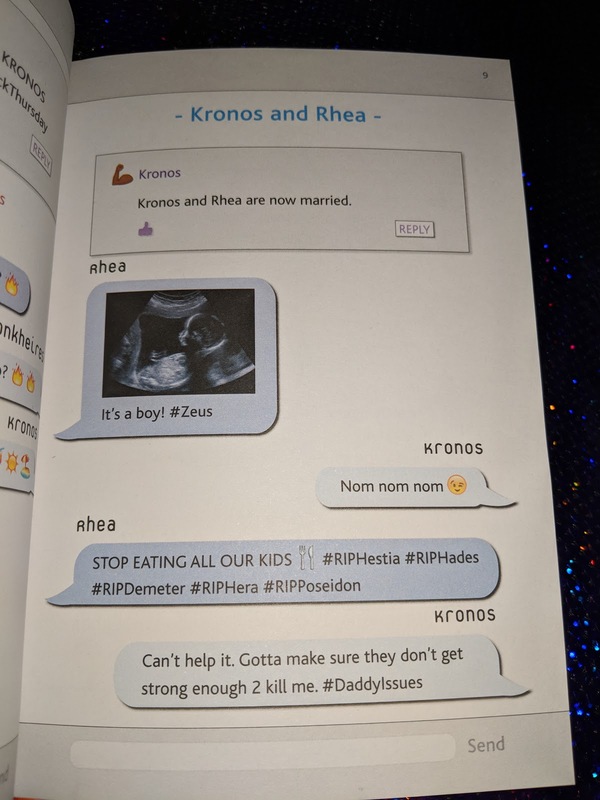 tl;dr D’Aulaires’ and Homer’s Greek myths told through characters texting with emojis, posting photos, checking in at locations, and updating their relationship statuses. The perfect gift for any reader—young or old—with a sense of humor! To ask other readers questions about Greek Gods #squadgoals, please sign up. I love Greek mythology, so I was very curious about this book because it sounded like a lot of fun. And it was! It’s written in a mix of text messages and social media posts, almost as if the gods are messaging each other. There are emojis present. It was amazing! Lol. The book, for being so short and such a fast read, actually goes through quite a bit of the Greek myths. They are concise and to the point and I really liked that. I particularly loved how funny this whole book was! Srsly, these books are to die 4!!! Okay, once again I was blown away by the immensely creative way this book was written. As an adult, some of the text shortcuts were not ones I understood or knew what they meant, but fortunately there was a bit of a glossary to help with that. As a high school librarian, I love how well this explains in an easy to understand way the Greek myths and really how messed up all of those gods were. It only took me two thirty minute lunch breaks to read this, as it is Srsly, these books are to die 4!!! Okay, once again I was blown away by the immensely creative way this book was written. As an adult, some of the text shortcuts were not ones I understood or knew what they meant, but fortunately there was a bit of a glossary to help with that. As a high school librarian, I love how well this explains in an easy to understand way the Greek myths and really how messed up all of those gods were. It only took me two thirty minute lunch breaks to read this, as it is a very quick read. But I was laughing and snorting the whole time! I even passed it on to one of the teachers in my school who used to teach mythology, and he loved it, and returned it me later that same day! I don't know if enough teachers know about these books, but I am going to try to get out there and share them with teachers more, as they are some of the best ways to get someone interested in all these crazy stories. So many parts that were snarky and just hilarious. The only thing that maybe I had an issue with was the WTF and FML abbreviations. Knowing what the "F" stands for did bother me a bit. However I also know that teens are using those abbreviations, so it is probably a bit naive to expect that would be anything new for them. ps. The views expressed in this review are my own and do not reflect the views of Indigo Books & Music Inc. or any of its subsidiaries. This book was an absolute riot from start to finish. I'm a grown woman, and even I found myself laughing at some of the clever jokes told through fictional social media posts and emojis in this book. While it's not likely to win any literary awards (it is, after all, written in "chat speak"), it is a perfect overview of Greek myths told in a way that most middle and high school students will understand very well. As a bonus for us not-so-savvy adults, there's a helpful glossary in the back expla This book was an absolute riot from start to finish. I'm a grown woman, and even I found myself laughing at some of the clever jokes told through fictional social media posts and emojis in this book. While it's not likely to win any literary awards (it is, after all, written in "chat speak"), it is a perfect overview of Greek myths told in a way that most middle and high school students will understand very well. As a bonus for us not-so-savvy adults, there's a helpful glossary in the back explaining what shorthand like ICYMI means ("In Case You Missed It," for those who are curious). For the teens this book is aimed at, there is also a helpful list of all of the characters featured in the book, sometimes with hilarious subtitles (such as "Niobe: not important"). Though I'm sure middle school students frequently use language like "FML" and "LMAO," I would feel more comfortable putting this in the hands of a high school student rather than an 11 or 12-year old. In my humble opinion, books like this are a fun, creative, and engaging way to teach teens about famous mythology and literature. This is certainly more helpful than shoving centuries-old texts at high school students and asking them to find meaning; it puts old literature into terms they can relate to (and also find hilarious), while getting them to talk to one another about classic stories. As an added bonus, this is also an insanely fast read; I'm pretty sure I had it finished in under half an hour. I might be a particularly fast reader, but I can easily see a high school student finishing this book in one sitting, so it could easily appeal to reluctant readers. Though I'm sure the ancient Greeks would be appalled to see their mythology treated in such a way, mythology is one of those subjects that just happens to be both strange and wacky on its own. Athena springs from Zeus's head in full armor, Kronos literally eats his children, and King Midas is granted power that lets him turn objects into solid gold. Let's face it; mythology is already pretty funny and crazy, so writing it in the form of instant messages and emojis just makes sense somehow. The book focuses only on the most well-known myths, but gives a quick and easy overview of some of the most important characters in Greek mythology. It might not be as in-depth as a textbook on Greek mythology, but it makes for an entertaining quick reference guide. While this book would be most appropriate on the shelf of a high school Classics teacher, I could also see it being a big hit on library shelves. Considering the popularity of books like the Internet Girls series (TTYL; TTFN; L8R, G8R; and YOLO), a book written in this unique style would be a hit with reluctant readers, especially those who struggle to understand classic literature and Greek mythology. While I can't bring myself to give it high marks for literary merit (though funny, the grammar is obviously appalling), it more than makes up for this with humor, creative story-telling, and excellent characterization of the pantheon of Greek gods. Carbone, Courtney Greek Gods #squadgoals, 115 pages. GRAPHIC NOVEL Random House, 2017. $10. Content: Language: R (21 swears; 22 “f”); Mature Content: PG-13; Violence: PG. This is a brief overview of the Greek gods told through texts and emoji’s. Starting with Uranus and moving through Kronos, Zeus and their siblings and children, there is a brief summary of their interactions with each other: deaths, marriages, betryals. Taking on the Greek myths is a daunting task, but to try and do it through Carbone, Courtney Greek Gods #squadgoals, 115 pages. GRAPHIC NOVEL Random House, 2017. $10. Content: Language: R (21 swears; 22 “f”); Mature Content: PG-13; Violence: PG. This is a brief overview of the Greek gods told through texts and emoji’s. Starting with Uranus and moving through Kronos, Zeus and their siblings and children, there is a brief summary of their interactions with each other: deaths, marriages, betryals. Taking on the Greek myths is a daunting task, but to try and do it through texts was a mistake. This book is confusing and disjointed even if you have a prior understanding of the major Greek players. There are four pages for the character list-it’s too much to keep track of in this type of format. I loved Carbone’s srsly Hamlet book of the same format, but this book is a flop. The swears are acronyms that have the “f” word, actual swears and emoji’s for the “s” word. There is a glossary at the back that interprets what the different emoji’s and acronyms mean. MS, HS – OPTIONAL. Reviewer, C. Peterson. Greek Gods is a unique little book that pretty much gives you a run down of all the gods and how they came to be by the gods themselves. What would things be like if the Greek gods had cell phones, well there conversations would be a lot different I am sure and this book gives us that view. It's written all in text and tweets from the gods themselves to their spouse or family members. You can read about all the different gods and what happened to them or how they get themselves in trouble and it' Greek Gods is a unique little book that pretty much gives you a run down of all the gods and how they came to be by the gods themselves. What would things be like if the Greek gods had cell phones, well there conversations would be a lot different I am sure and this book gives us that view. It's written all in text and tweets from the gods themselves to their spouse or family members. You can read about all the different gods and what happened to them or how they get themselves in trouble and it's a super fast read and easy to understand. Well, for most people. I had to look up some of the lingo in the glossary in the back but I am sure most teenagers will understand all the texting lingo. It was a fun and wacky way to learn about mythology and I really enjoyed it. If you a mythology fan then you might want to check this one out, it's just a lot of fun! Ever wonder what the Greek Gods would be like in today's smartphone, text-speak, social media society? Well, Greek Gods #squadgoals is for you. 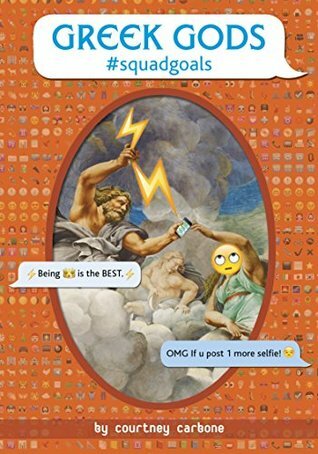 It's a goofy, fun slim book that tells the entire story of the Greek Gods pantheon all thru texts, emojis, and social media posts. Having a base knowledge of original myths helped make this especially funny for me, but you don't really need to be that familiar with the myths to still have fun reading the book. I thoroughly enjoyed reading this and would Ever wonder what the Greek Gods would be like in today's smartphone, text-speak, social media society? Well, Greek Gods #squadgoals is for you. It's a goofy, fun slim book that tells the entire story of the Greek Gods pantheon all thru texts, emojis, and social media posts. Having a base knowledge of original myths helped make this especially funny for me, but you don't really need to be that familiar with the myths to still have fun reading the book. I thoroughly enjoyed reading this and would recommend it to anyone that likes taking a different look at the Greek Gods mythology. It's hard to make me laugh, and I rarely LOL when reading, but I busted out laughing several times in this little gem of a book. This is the first of these books I've read and the first I've purchased for my HS library, but it certainly won't be the last. I handed it off to my teenagers several times, and my 15-year old daughter is reading it now. Many stories of the Greek gods are told via texts, emojis, and social media. And they are so stinkin' creative! It is a very quick and thoroughly enjo It's hard to make me laugh, and I rarely LOL when reading, but I busted out laughing several times in this little gem of a book. This is the first of these books I've read and the first I've purchased for my HS library, but it certainly won't be the last. I handed it off to my teenagers several times, and my 15-year old daughter is reading it now. Not the best offering in this series. I think if the author had done longer versions of fewer myths it would have been better. I don't think this is one that makes sense if you don't already know those stories. Also, in the section about the War of the Titans, the book keeps saying that Zeus etc. are the siblings of the Titans, when not only is this not true it directly conflicts with the previous section about Kronos and is really confusing just within a couple of pages. This review has been hidden because it contains spoilers. To view it, click here. Tales of the Greek Gods retold as facebook posts and text messages... just imagine if these guys were around as real people today. Some of them do such weird things, like what's with Kronos eating his children, and the guy who made his son into a stew?! Personally not too into the chat lingo and excessive use of emojis, but I like how this book condenses the stories into light reads. I know I'll be reading the others in this series. All of the books in this "series" are cute, but this one was fantastic. I laughed out loud at almost every page, and just had a total blast reading this. This was definitely my favorite in the series! Oh, and I'm so glad there was a glossary in the back. I know the common text abbreviations, of course, but there were still a ton used here that I had to look up. In the same vein as the other OMG classics. I felt some of the mythos was a little lost in translation to text. I know it is a parody, but like with the others, the core of the play was still there with a lot of comedy. However, overall, very funny and great like the others. It was alright! Just a cute, quick read. If you don’t know the stories, some of them aren’t explained that well and it gets confusing at times. But I can’t lie, it did make me laugh! A fun introduction to Greek myths for the emoji-literate! Greek myths via text. Quick read, captured the essence of the myth not necessarily all the details. These books are just so fun. They’re short and sweet, but they’re a great laugh and I like that she chose some not-so-popular tales from Greek mythology. A fun way to read some of the old Greek stories. Hilarious social media version of the Olympians. I loved how they told the lengthy story in emoticons and group chat speak. Thanks to my school librarian for sharing this with me. I actually learned a lot with this and in a fun way! I can't wait to pick up more of the books in this collection. Reading this while reading Circe by Madeline Miller was seriously an adventure from start to finish. I liked srsly Hamlet by this author but it’s a bit much to try and take on the Greek gods in text format-it was choppy and disjointed. I also didn’t love the amount of F word acronyms throughout. This is such a fast, fun read, I giggle snorted so hard I thought I was going to do permanent damage to my nasal passages. What a gun, millinneal twist on Greek mythology.